This post is going to be crazy picture heavy so let's just get right to it. I received my Little Black Bag today and I'm super excited this was my biggest bag yet and I'm really happy with the products and I also made my very first YouTube Un-boxing Video for this too! This is the Street Level Large Multi Compartment Satchel and it's much bigger than I thought it would be. I do like that it has the pull out pouch in it but I"m a little disappointed by the side zippers they are hard to zip and tend to stick! I'm so glad I got this it's so cute! 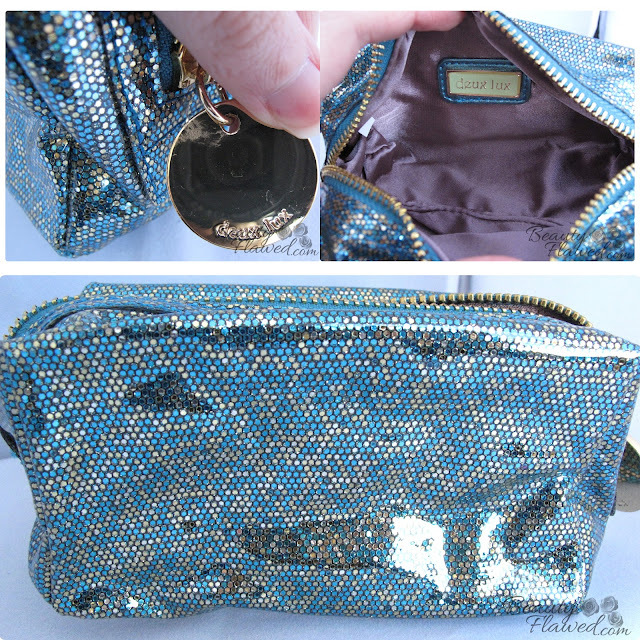 This is the Deux Lux Sparkle Baby Pouch in Twinkle and it's much more blue in person than it is on the website which I like very much. It has a cloth lining which is cute too. 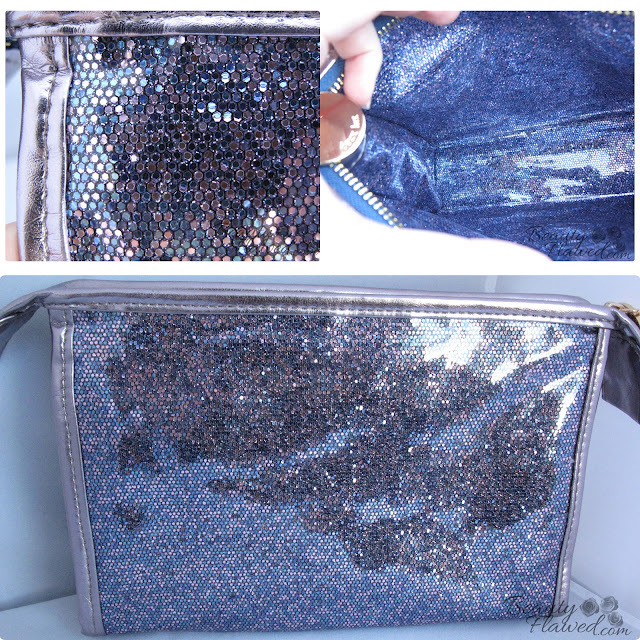 Next up is another cosmetic bag this time it's the Deux Lux Sparkle Baby Cosmetic Bag in Sapphire. This is such a pretty bag it's purple with bits of pink! The inside of this is the same as the outside so if any makeup leaks it will be very easy to clean. I've wanted this since my second month on the site and I'm so glad I got it. 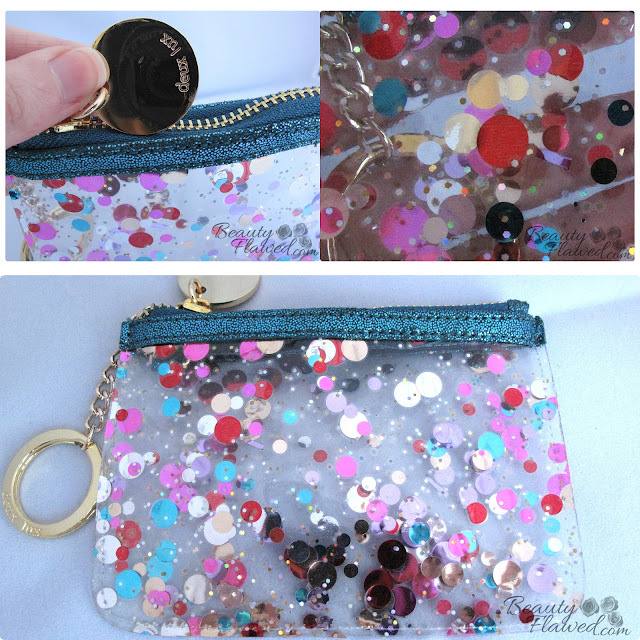 This is the Deux Lux Confetti Coin Purse in Teal! On the website it looks frosted but it is actually clear and I like that better since it brings out the confetti colors more. 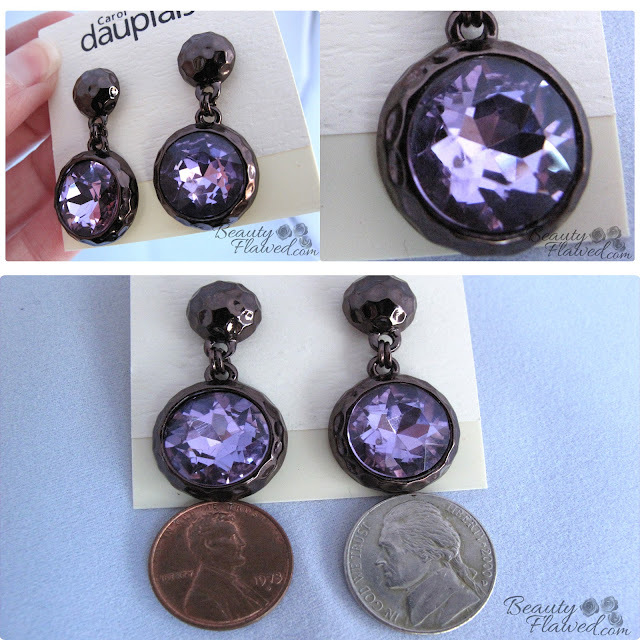 Next we have these earrings by Carol Duplaise they are the Hammered Drop Earrings and I love the colors of the stones. They are bigger than I was expecting being about the size of a nickel, I don't actually have pierced ears but I think one of my sister's will like them and if not I'm sure I can think of some sort of DIY jewelry to turn them into since they are really pretty! Lastly this month Little Black Bag partnered up with Benefit Cosmetics so with every bag you received a bonus sample of one of their products. I ended up getting 4 samples and they sent a one time of the Porefessional and their Spy Gal Comic Book! My samples are Watt's UP! 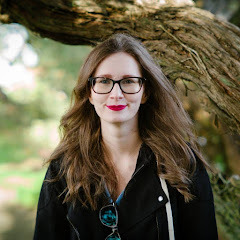 something I already love (the full review for that is here), It's potent eye cream, Stay don't Stray primer, and They're Real! Mascara. 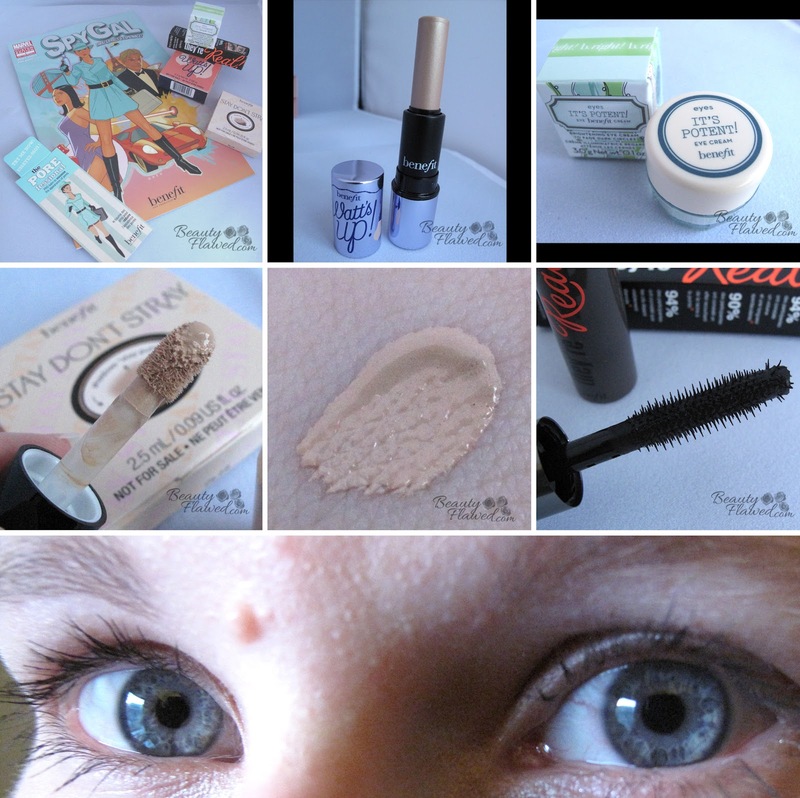 I like the mascara it's nice the pic above is with one coat and all I did was curl my lashes before hand. 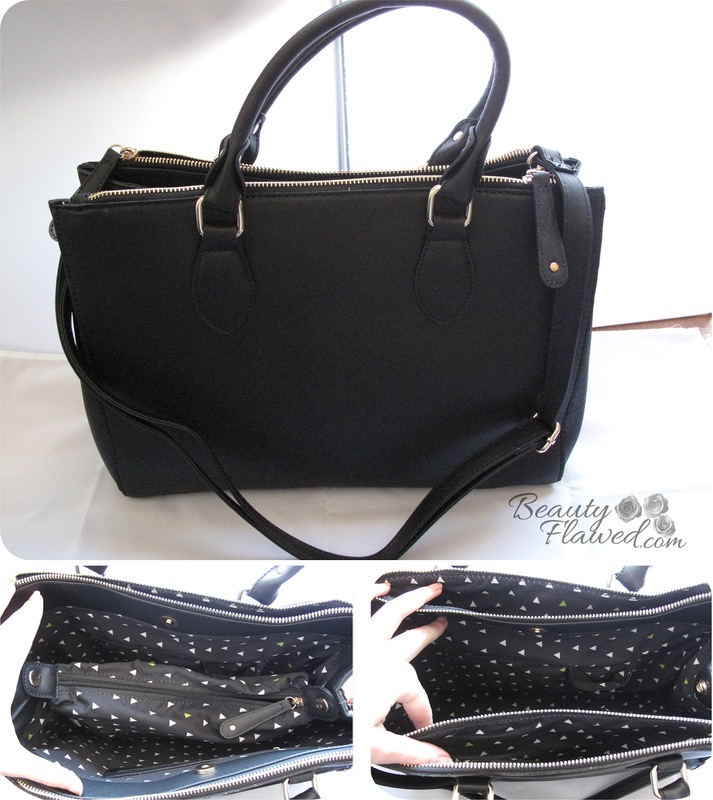 What do you think of my September 2012 Little Black Bag? So many sparklies! I really like all of your items! I'm pretty jealous of the Benefit samples. I really like the multi compartment bag, I could really use that for school! I can't wait to get my LBB this month, I've been wanting to try the Benefit Watts Up and They're Real mascara foreverrrr....so happy I got them in my bag. The two sparkly bags are just so cute! I am impressed with your little black bag delivery this month! I've tried stay don't stray, but it still creased on me. My favorite eyeshadow primer is urban decay eyeshadow potion primer, that thing is FAB! Love the bags you got super cute. Samples are always great i love them for travelling. OMG! I have never heard of this before!!! I am going to check out their site now!!! You got some Ah-mazing stuff!!! I really love it all!! Thanks for the tip and sharing!! I love the bag you got! It's a really great size and all those sparkly bags are too cute! Gorgeous bag!! And I love all the sparkles! loveee this bag it's gorgeous! This is so cute! I haven't heard of Little Black Bag, so thank you for the intro! I really like the 2 sparkly cosmetic bags! i have been SERIOUSLY debating doing LBB but all I've seen and read it feels overwhelming! though i am a HUGE DEUX LUX fan and own like 5 of thier bags cause they are AMAZING! do you have to do it every month or can you skip a month? i don't know if i can stomach $50 a month... hmmm. oh my gawddddd i need something like this in Canada!! i checked out your link to the site and it says that they are hoping to ship to Canada soon so i am crossing my fingers - i really do not need to subscribe to anymore services but this one sounds so awesome! the trading option really makes it unique and fun.